This is a genuinely weird little find: an Italian transistor organ with built-in rhythms and a wonderfully future-retro styling. It’s made by a company called GIS (no, us neither) and it’s called the Skyline. The innards comprise a three-voice transistor organ with Flute, String and Oboe patches – which can be combined to form seven sounds in all – plus a neat little preset rhythm section, with a thick analogue sound not too far from early Korg units. The rhythms are also combinable (if you lean on the buttons) which can make for some great, slightly mad, combos (Latin Waltz Tango, anyone?). All the sounds come piped out of an internal amp and speaker assembly which adds a great mellow warmth to the transistor tone. The whole thing is wrapped up in a matte black console with bevelled edges, on a column stand attached to a plinth, which makes it look like it’s been salvaged from the command deck of an early nuclear sub. Now let’s talk about the sounds themselves. To our ears these were quite a surprise: the Oboe is rough-edged and raucous, but the Strings and Flute patches are rounded and thickly sweet. The combos are even better, making for complex waveforms with a very distinctive character – again, there’s a quite delicate quality to the higher registers that makes for very airy pad sounds. Something particularly alchemical seems to happen when you put all three buttons in for the Flute + Strings + Oboe combo: a very rich and satisfying pad sound emerges which has a sweet, evocative edge unlike what you’d expect from a transistor machine. It quickly became clear to us that the only way to capture this vibe was to sample the combo patches along with the basic patches (rather than using layers of the basic patches to recreate the combos in Kontakt). It was really worth the extra effort: the four combos (Flute + Strings, Strings + Oboe, Flute + Oboe and All Buttons In) are, to our ears, the cream of the Skyline crop. Check out the audio demos to see what we mean here! We had great fun sampling the onboard rhythm presets, and Mongo has rolled his sleeves up and coded these so that they can be switched in, combined, layered up and will automatically tempo-sync to your host DAW. As well as front-panel control via the funky switches, there are MIDI notes assigned to these patterns (right down in the lowest octave of the MIDI span) so that you can program them into your sequencer’s piano roll display and fire them off within your tracks. Additionally, we’ve captured multiple samples of the raw individual drum hits themselves: kick, hats and snare. Again, you can find these assigned to keys down in the bottom MIDI octave, so that you can easily play them live or program your own patterns using the Skyline’s sounds. Partly as a result of having been mic’d through the Skyline’s speaker (it has no outputs) the rhythm sounds have a lovely rounded warmth to them that makes them very usable in their own right as analogue beat box sounds. The Skyline would appear to be rare as hen’s teeth: in fact, we can’t find a mention of it on the InterWeb. Anywhere. (If you have any info, get in touch!) This means that both its keyboard tones and its rhythm sounds are pretty much unique to the world of Kontakt samples right now. We love its inherently sweet tone, which seems to come from those analogue transistor sound waves having their edges knocked off and their mids filled out by the onboard speakers. And of course we’ve added in some extra goodies to help you get the most out of the Skyline spirit. 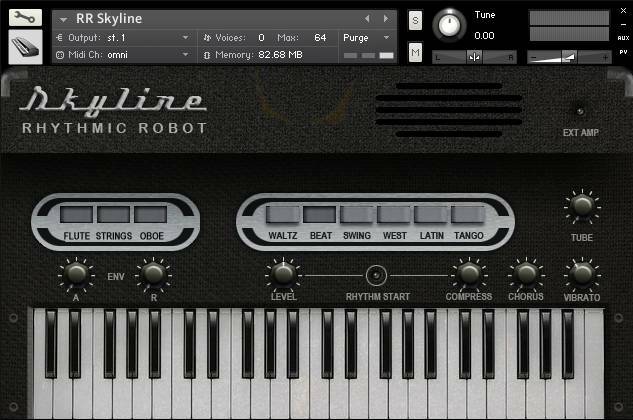 The Keyboard sounds have Tube saturation and Vibrato controls to give them some extra warmth and movement, plus a lovely lush Chorus to give you some string machine swirl. The Rhythm section has its own Level and Compression controls to mould its sound to your taste and balance it against the keys. 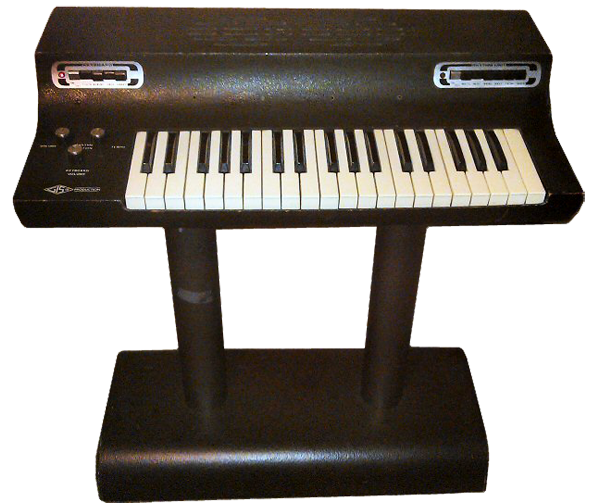 Meanwhile, the whole thing can be put through a hand-chosen Amp Cab model to give it some air and a real “live” feel – this really brings the Keyboard sounds to life. Plus of course there’s control over envelope Attack and Release, to dial in smooth pad sounds, long sustains, and “reversed” tones. We love these little left-field oddities that turn up skulking in the back corners of car-boot sales and people’s garages. Skyline has really taken us by surprise, and won our hearts: it’s sweet and warm and has a personality entirely of its own. Half basic string machine, half preset transistor organ, with a hefty dollop of early analogue drum machine thrown in, it’s a unique little machine chock full of character. Take one home with you today! I’ve always been a fun a fan of those funky old transistor ograns you see at thrift stores from time to time. But they are huge and heavy! This sample set is great way to have those quirky, fun sounds (including the cheapo preset rhythms), without having to freak out everytime I have to move. The kontakt instrument is very well laid out and super playable. The compression actually works great on the drums, and the chorus sounds really good on the organ. My favorite part though, is the speaker emulation that can be toggled on and off. With it on, you get a cool live feel that really works with these unique sounds. This is fantastic. Sampled very well and fully evokes that vintage feel. I think I will find this very useful on an 80s score I will be working on soon. The drum beats are a nice added bonus as well.